Bone broth! It’s the best. What’s so great about it? The list goes on. 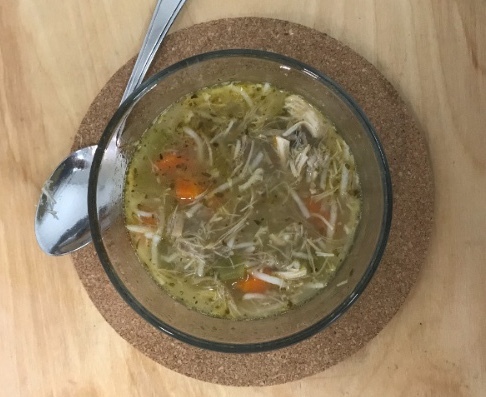 Even bet­ter, it’s super easy and cheap to make, and I’ll bet every night you have the tools to make a great soup without hav­ing to do more work. Do you eat veg­gies? (that’s a yes, right?) Do you eat meat? Do you have leftover scraps from peel­ing veg­gies and cook­ing chicken/​duck? For three weeks, col­lect in your freez­er all of the scraps of chick­en bones, car­rot peel­ings, knobs of cel­ery feet, onion ends and skins, herbs (stems and all). Once you have a decent amount of chick­en car­casses and bits veg­gies, put them all in a very large stock pot (10 – 15 L is ideal). Bring all of the above to a boil. Once boil­ing, bring down to a sim­mer for 4 – 6 hours. If you leave it for longer, that’s fine — you can’t over­cook a bone broth. Once cooled, strain into ster­il­ized mason jars (care­fully) and store in the fridge. Anywhere need stock: soup, gravy, rice/​quinoa/​lentils… just add and enjoy. Your immune sys­tem will have a major party! Was there a lot of good meat left when you strained the stock? Great! Shred, add stock and some rice or noodles. Instant soup! You will notice that the product here looks quite thick and gelat­in­ous for a “broth”, espe­cially after it cools. Typically broth is thin­ner and stock is thick­er. However, recently what we call bone broth is really a stock, with the focus being bones rather than meat. This gelat­in­ous­ness is from the col­la­gen-rich gelat­in (go fig­ure) which comes from car­til­age break­ing down dur­ing the long slow cook­ing time. The col­la­gen is what we’re going for here. Reduce waste. Reduce costs. Boost your immune sys­tem.